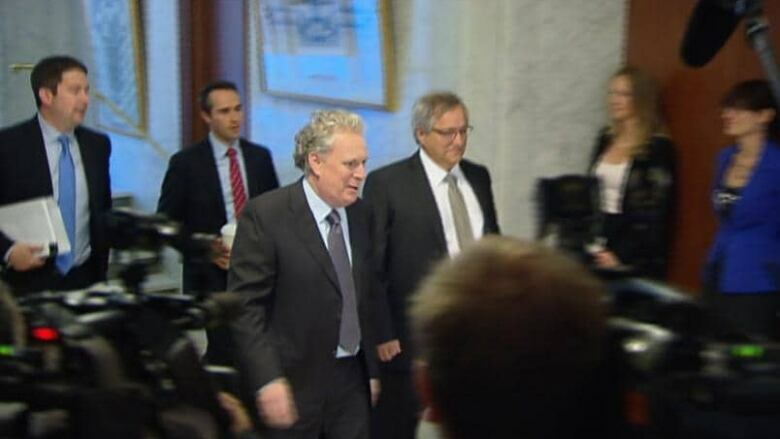 The morning after nearly 700 people were arrested in protests in Montreal and Quebec City, Jean Charest announced he has replaced his top aide with his former right-hand man. In the midst of the province's expanding social unrest, Premier Jean Charest on Thursday replaced his chief of staff, Luc Bastien, with Daniel Gagnier, a former top Liberal adviser known for steady competence. The pressure is mounting on Quebec to resolve the student crisis and end nightly protests across the province that have netted hundreds of arrests in recent days. Quebec Education Minister Michelle Courchesne acknowledged Thursday "the situation is really, really quite serious," and student conflict must be resolved. A third round of talks with the province's three main student federations will happen soon, Courchesne said — likely in the next few days. Federations representing CÉGEP college and university students, as well as the more militant CLASSE group have all agreed to resume negotiations with the Liberal government. The groups say they're ready to talk even if Quebec's hardline emergency protest law – Bill 78 – isn't on the table. But student leaders maintain the crisis could be defused if the contentious legislation was scrapped. "If the government really wanted to show its intention to discuss with us, the best move would be to suspend or repeal Law 78," said CLASSE spokesman Gabriel Nadeau-Dubois. "That would have a concrete effect on tension in Montreal streets." So far the Liberal government has refused to discuss Bill 78, which was adopted last week to widespread criticism. The emergency law restricts the timing and location of protests with heavy penalties for organizers, measures that have only fuelled public anger as thousands spill into Montreal's streets every night. Finance Minister Raymond Bachand echoed the need to defuse the crisis, which he says "is hurting Montreal." Bachand warned Montreal's busy summer tourist season could take a major hit, if would-be visitors to festivals and other events get scared off by the threat of rioting, news of which has already been published and broadcast around the world. Gagnier worked with Charest during the premier's short-lived minority government in 2007, and helped shepherd a second majority for the Liberals a year later. According to The Canadian Press, Gagnier has already been heavily involved in recent weeks as an outside advisor to Charest's government. Gagnier has been being given a mandate to kick-start negotiations with student groups and seek a resolution to the unrest plaguing the province's major cities. Nightly tuition protests ramped up after the law's adoption last week, with civil rights groups joining students and their supporters in the streets. Montreal authorities moved in on protesters Wednesday night, kettling them and arresting at least 518 people. The sweeping arrests mark a new single night record since the start of the tuition conflict. The majority of those arrested in Montreal will face fines, police said. Some will be charged under the Criminal Code. In Quebec City, police detained 176 people under the provisions laid out in Quebec's controversial new protest law, known as Bill 78. That demonstration was declared illegal because protesters refused to give police their route in advance, one of the provisions of the new law. Police later ticketed them under the traffic act for blocking the roadway. Wednesday night's protest unfolded peacefully for several hours before the situation unravelled. "This is the 30th night of the protest," one woman told CBC's Tom Parry. "Can you imagine what's going to happen when there's summer festivals? … We're going to keep marching. It's not going to stop. Negotiations have to happen." 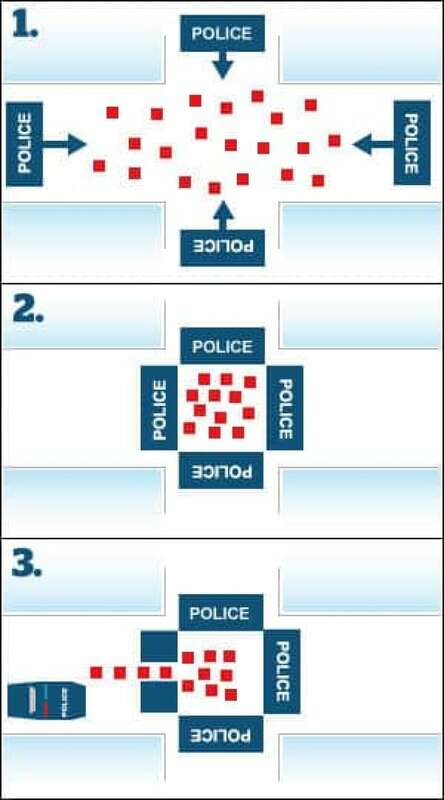 Kettling is a police tactic widely used in Europe where riot police surround demonstrators and limit or cut off their exits. It has been widely criticized because it often results in the scooping up of innocent bystanders as well as rowdies. A recent report by Ontario's police watchdog blasted Toronto police for their use of kettling during the G20 summit two years ago, saying they violated civil rights, detained people illegally and used excessive force. Const. Daniel Lacoursière of the Montreal police said officers were in danger and had to act. "Their physical integrity was in jeopardy," he told CBC News. "That's why all these arrests were made at the corner of St-Denis and Sherbrooke." Riot squad officers had been marching on the sidewalk beside the front of the protest all evening. An order to disperse was given when protesters arrived at Sherbrooke Street, because police had been pelted by projectiles and other criminal acts had been committed, Lacoursière said. The group had also apparently resisted going in a direction ordered by police. Those arrested could face charges under municipal bylaws or the Criminal Code. The swift police action squeezed the mob together tighter and tighter as the officers advanced and some people begged to be let out, pleading they were bystanders. One photographer was seen to be pushed to the ground and a piece of equipment was heard breaking. Some protesters cursed and yelled at provincial police officers, who ignored the taunts. Emmanuel Hessler, an independent filmmaker who had been following the march for a few blocks, said in a telephone interview with The Canadian Press from inside the police encirclement that he was surprised by the action, saying, "Suddenly, there were police all around us." Some of those arrested in Montreal were taken to the police's eastern operation centre, where they were processed and released Thursday morning. Several people who emerged bleary-eyed from the detention centre said they were bewildered by what had happened to them. They said the march was unfolding peacefully when all of a sudden they were cornered by police at the intersection of Saint-Denis and Sherbrooke streets. They said they were made to wait for several hours and read their rights en masse. One protester leaving the detention centre said he was issued a $600 ticket. He described the police action as heavy-handed as officers were ordering the demonstrators to leave, but were blocking the way out. Crowd control: What is kettling? Is kettling a valid police tactic?